Alfalfa, sunflower, green pea, daikon radish, broccoli... As well as peanuts, garbanzos, black beans, black eyed peas, green peas, fenugreek, (say it out loud--it's fun!) red and brown lentils, mung beans, wheat berries, and sunflower seeds. The big seller? 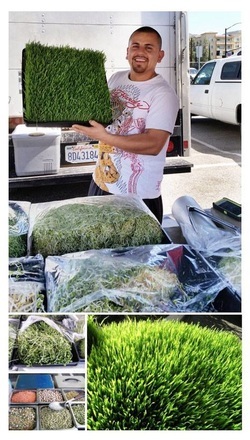 FRESH WHEAT GRASS! You can buy ready-to-chug shots, or a whole flat (see photo) so you can juice-out at home. ATTN CAT LOVERS! Marlon sells feline-sized containers for your Indoor Kitties that dream of wide-open green spaces.